“Do I remove my shoes?” I asked sheepishly as Chef Shen laughs and warmly welcomes me into her home. I took my place at the dinner table and awkwardly shift about my seat. Attending a private dinner in a stranger’s home is possibly the weirdest thing I’ve done in 2018. How do I act? Do I make friends? Am I supposed to eat at the same pace as others? As the saying goes, the best food is the kind that’s cooked at home. We all love the comfort of a good home-cooked meal but the idea of stepping into a stranger’s home for dinner might sound a little strange to some. Private home dining experiences are emerging here once more. It’s not difficult to understand why as the modern consumers can be tired of ‘outside’ food and would prefer a ‘simple’ home style cooking instead. However, it’s not exactly the cheapest option either. Some menus may cost anywhere between $80 – $100, some with unique creations and a long waiting list you have to book months prior. 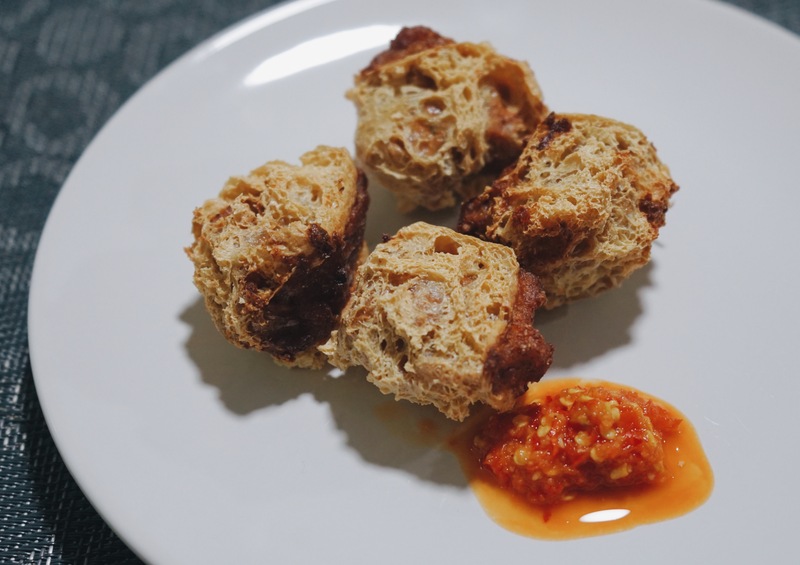 Even though the price-tag seems high, a lot of Singaporeans are willing to fork out good money as many of these concepts offer recipes which are not commonly found anymore. The Cook: Durian Tempoyak with Pork Ribs, Bacon Ice Cream Sandwich and Wasabi Chocolate – if you think these combination of sweet and savoury are weird, Chef Shen Tan, a virtuoso of mod-sin cuisine takes it to the next level. 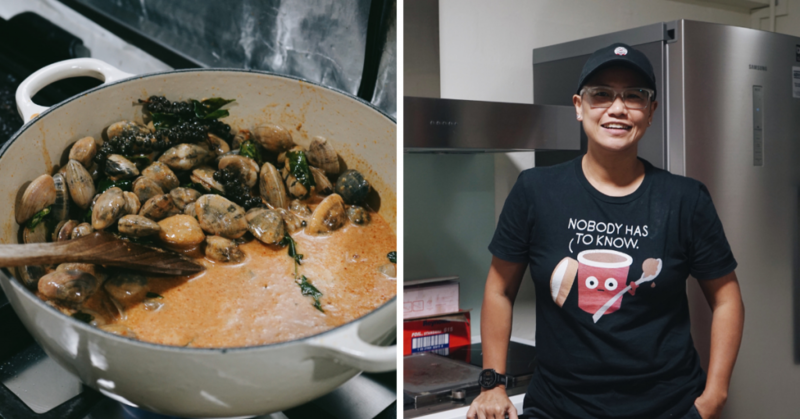 After leaving her corporate job 10 years ago, she jumped into the F&B industry despite having zero culinary background. 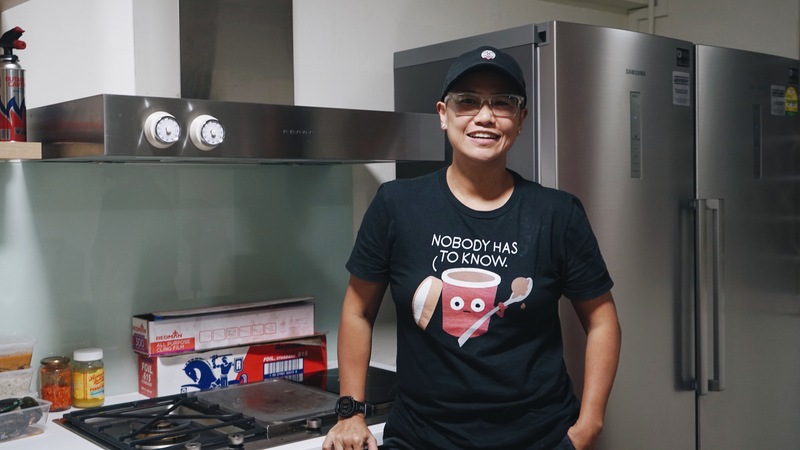 Famed for her Nasi Lemak at Revolution Coffee and her first restaurant venture, Wok and Barrel, Chef Shen now opens her home to public for a gastronomic experience like no other. And she’s named it Ownself Make Chef. Ownself Make Chef is about Chef Shen’s journey as a self-taught chef and her culinary explorations. Getting inspirations from her runs and afternoon reads, her food revolves around Singaporean and Southeast Asian flavours. 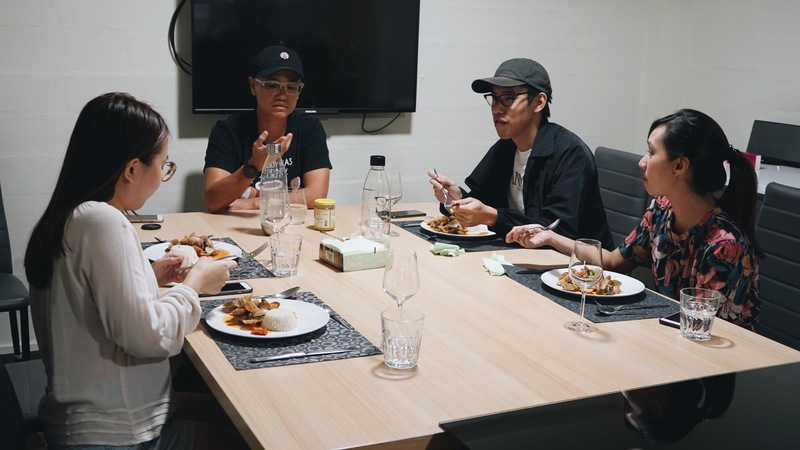 The Setting: Conveniently located 5 minutes away from the MRT, who would’ve thought that a three-room HDB flat in Commonwealth plays host to some seriously amazing food creations. I was warmly welcomed into her house and walked in to a minimalist dining area that could comfortably sit up to 12 people. Soft music was playing in the background as Chef Shen prepares the first course of the day. Her kitchen is located right next to the dining area so you could observe Chef Shen as she prepares the courses throughout the evening. I was lucky enough to attend the Sinfully Seafood Dinner ($99 per pax) and it was a dinner that was about to change my life (no kidding!). The Menu: Truly the queen of puns, just her menu names alone are worth a revisit. From the aPORKalypse Dinner to Rice to The Occasion, her menu rotates each week so diners can always expect something new each time they dine with Ownself Make Chef. There’s a total of 12 menus to date with new ones in the pipeline. Her dinners are so popular that she’s all packed till January 2019. Check out her website and reserve a spot before they’re all sold out again. Or simply gather a group of 8 and organise a private dinner instead! 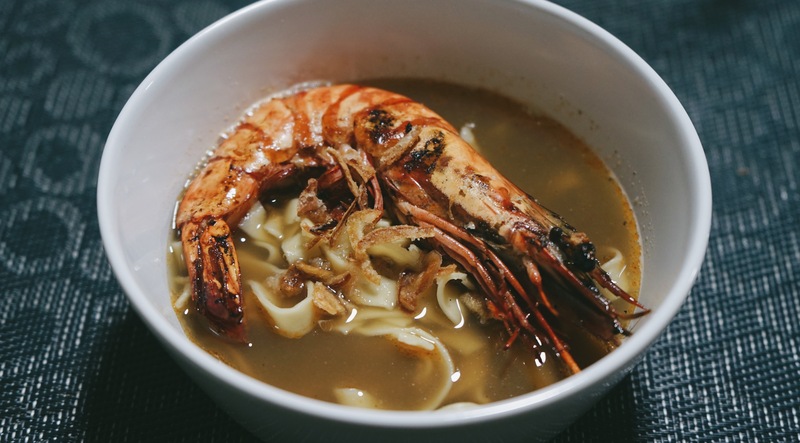 The Food: Working with the best of local seafood from Ah Hua Kelong in Singapore, the Sinfully Seafood Dinner is created for seafood lovers who enjoy Singaporean flavours. Working with familiar local flavours such as Mee Siam, Salted Egg and Durian, this 8 course seafood dinner is far from ordinary. We finally sat down for the first course. Growing up eating Mee Siam, most of us are familiar with its rich and sweet taste. For this dish, Chef Shen breaks down Mee Siam and turns it into a ceviche which is a seafood dish typically made from fresh raw fish cured in citrus juices, such as lemon or lime. The botan ebi, hokkaido scallop and grouper are cured in kalamansi lime and mee siam rempah, mixed with pineapple, cucumber, coriander, spring onions, chilli, chinese chives and topped with tau pok croutons. What you get is a light and refreshing version of the Mee Siam that we all know and love. We can all agree that the salted egg trend has gotten out of hand within the past two years and it’s about time we put an end to it. But we won’t say no to this Salted Egg Yolk Aioli. The whole shucked oysters are lightly marinated with fish sauce and sugar then battered and fried. 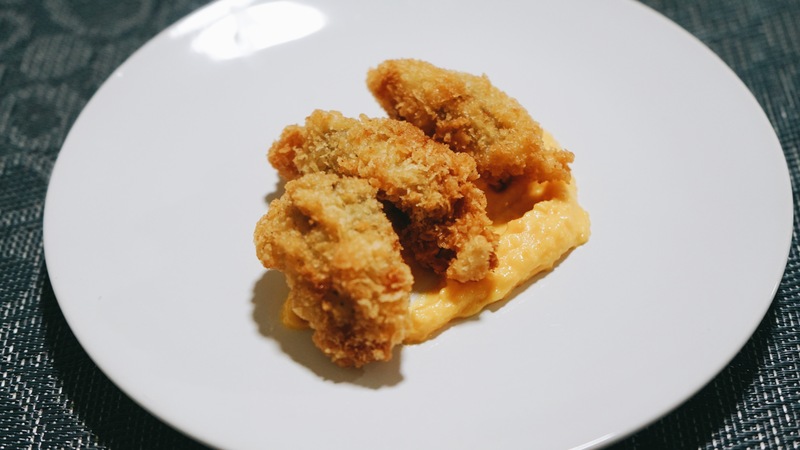 They’re then served with a side of housemade salted egg yolk aioli. Who would’ve thought oysters and salted egg could go so well together. This was hands down the best dish of the night just because of all the elements that went into it. Also, plus points for creativity. The tau pok is turned inside out and stuffed with otak mousse, blood cockles, torched ginger flower, leeks and deep fried. It is served with a side of sng ngee which is made up of garlic, lime juice and a handful of chilli padi. It may look like any ordinary chicken rice chilli but this one surely packs a punch. For someone who can take her spice, I found myself choking from the heat of the chilli. The handmade oyster pasta is the star of the Hae Mee Tng. Instead of using regular yellow noodles, Chef Shen infuses oyster in her pasta which elevates the flavour of the entire dish. The broth is made with pork bones, carrots, shallots, swimmer crabs, prawns and clams. You can also expect the freshest jumbo prawns that have been grilled with crustacean infused lard. It’s then garnished with crispy shallots and lardons. Famed for her Nasi Lemak, you know you’re in for a real treat. Her signature dish is painstakingly cooked by steaming the rice twice over four hours. 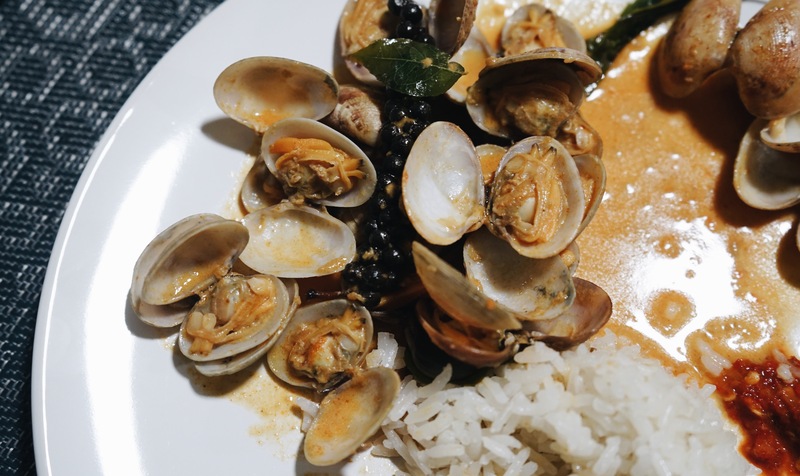 This time, instead of having it with a fried egg and chicken wing, we’re treated to a generous portion of local clams and kampot green peppercorns cooked in a mild lemak curry served with sambal belachan. The black grouper from Ah Hua Kelong is cured in salted egg and curry leaves which results in a lovely firm texture. 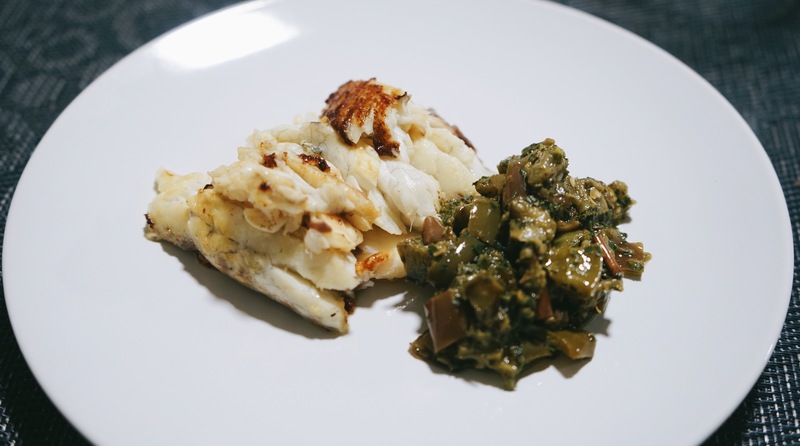 The grouper is paired with grilled vegetables tossed through her own Thai basil laksa leaf pesto. 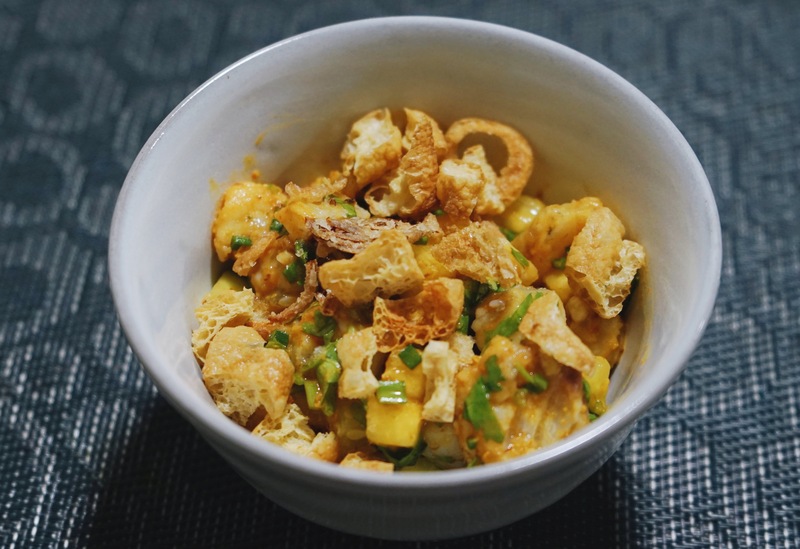 If you’re a huge durian fan (or not), you’re definitely going to love this dish. 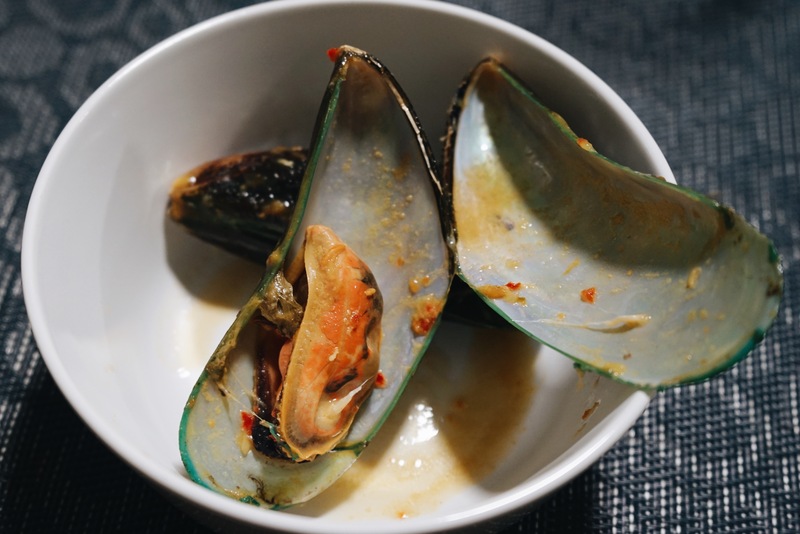 The super fresh mussels from Ah Hua Kelong are cooked with fermented durian from Ah Seng Durian, leeks and bacon. Ending off the 8 course dinner on a high note is a sweet and savoury dessert. Just when I thought that Chef Shen was done with surprises, the last dish did it for me again. 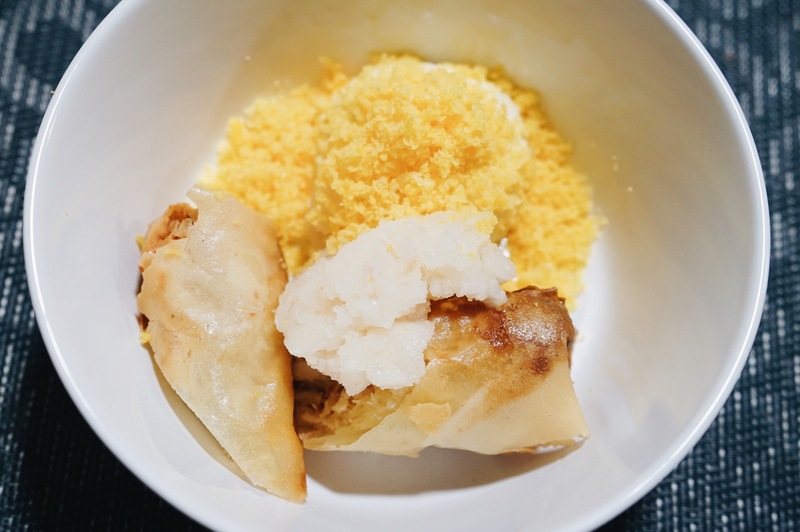 The sweet crepes are stuffed with a mango and crab filling, served with kaffir lime leaf lychee sorbet, salted egg yolk ice cream and grated salted egg yolk. This is the only time we’re not complaining about salted egg yolk in our food. Let’s just say, this isn’t your average dessert course. Helming Wok and Barrel, Ujong and Revolution Coffee in the past, Chef Shen’s creations were nothing short of amazing and it definitely set the bar high for all future private dining experiences. She regularly posts sneak peeks of upcoming dinners on her Facebook page and website. In a city state known for its rigidity and conservatism, the chance to have an intimate and private experience is indeed an exciting , fresh-feeling proposition. But if you think getting into someone’s house for a private dinner is easy, think again. Many private dining experiences involve multiple emails, follow ups and a long waiting list. But once you score an invite, the back and forth is well worth the effort. You’ll not only be treated to an exceptional meal but an unforgettable experience too. Check out Ownself Make Chef for Chef Shen’s upcoming dinner.